Toilet won’t flush? There are several possible reasons why nothing happens when you pull the lever or push the button on your loo. In this article, we’ll explain the common faults and how they can be fixed. In order to understand why your toilet won’t flush and how you can fix it, you need to know a little about the components inside the cistern. A typical British toilet uses a plastic siphon to draw water out of the cistern into the pan. Pulling the flush lever on a toilet raises a plastic diaphragm in the bell of the siphon. The diaphragm lifts a body of water up to the neck of the siphon, where it then spills over and down through the outlet. A siphon effect is created, and the rest of the water is drawn out of the cistern. While the plastic diaphragm is flexible enough to allow the moving water to pass by it, it is supported underneath by a plastic frame. This ensures it has the rigidity to lift the water above the water line in the cistern. The diaphragm of a toilet siphon. Once the flush lever is pulled and the siphon is active, the plastic flap flexes out of the way to allow the water to pass. If your toilet won’t flush, a faulty siphon diaphragm may very well be the cause. As for the filling of the toilet cistern, this is usually controlled by a ball valve. This uses the water level to open or close a valve by means of a plastic float. When the water level in the cistern falls, the valve is opened, replenishing the cistern with water for the next flush. In the event that the ball valve fails, an overflow pipe will allow the excess water to drain out of the cistern. If your toilet won’t flush, the very first thing to check is the contents of the cistern. 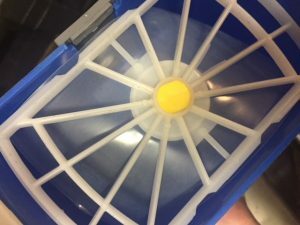 Take the lid off and have a look inside – is there actually water in there? Take a look at the ball valve. Has the arm become jammed upwards? Gently moving the arm up and down may make the water flow again. If the arm moves freely but the cistern does not refill, then the water supply to the cistern has become interrupted. There is usually an isolation valve on the supply pipe, which is operated by a blade-edge screwdriver. Double check that this is open – the notch in the screw on the valve should be in line with the pipe. If it’s closed and there’s no reason not to open it, give it a quarter turn with a screwdriver. Toilet cisterns are either fed from the mains or from the cold water storage cistern in the loft. The cold water storage cistern may also supply other cold outlets in the bathroom. It will also supply the hot water cylinder. Check the other bathroom cold taps – do they work? If several other water outlets don’t work – and the kitchen cold tap does – then this suggests that the cold water storage cistern is not filling up. If you are able to go up into the loft, then take a look inside the storage cistern – there is a good chance it will be empty. Has the ball valve got stuck? Try the same thing with this ball valve and move the arm up and down. If the storage cistern starts to fill up, you have solved the problem. However, you should consider replacing the ball valve, as it may seize up again in future. If cistern is full of water, the next thing to consider is the flush mechanism. The flush lever on the outside of the cistern is connected to the diaphragm inside the siphon via a small chain or piece of plastic. This link attaches to the siphon via a metal loop or hook. A faulty flush mechanism may very well be the case if the flush lever feels extremely light and makes a different sound. Check to see these components have become disconnected. If they have, reattaching them should solve the problem. If they are broken, you should be able to buy replacement parts from your local DIY store or plumber’s merchant. If the flush mechanism works, the next suspect is the diaphragm, which may be the case if the toilet will only flush in a certain way, depending on how hard or softly you pull the lever. A broken or punctured diaphragm cannot raise the water inside the siphon – the water simply passes through it. In this situation, the diaphragm must be replaced. If this isn’t possible, then you will need a new siphon. Either of these solutions means isolating and draining the cistern, disconnecting the pipework and unscrewing it from the wall. This entry was posted in Faults and tagged toilets. Bookmark the permalink.